Over the last year numerous attempts have been made to place the blame for the August 21st Sarin attacks in Damascus on opposition groups, in an attempt to deflect criticism away from the Syrian government. These attempts have come from various sources, but thanks to open source information it’s been possible to debunk these claims as they’ve been made. One early example, repeated by the Russian government, was the videos were uploaded the day before the attack, proving the attacks were propaganda. A simple investigation revealed this was in fact due to videos uploaded to YouTube have a displayed upload date from the US based servers, with the actual upload date being part of the YouTube metadata. This was one of many now discredited attempts to blame the opposition for the attacks. What has become clear over the past year, as various theories have fallen to the wayside, is the use of “Volcano rockets” to deliver the Sarin on August 21st, and the composition of the Sarin, have become key points in discerning who was responsible for the attack. Volcano rockets are unusual as they have a unique design not seen outside of Syria, coming in both explosive and chemical versions, and in different sizes. Videos posted by forces loyal to the Syrian government have shown them using the explosive rockets, and the chemical type were linked to previous attacks on opposition forces going back to late 2012. Work by Dan Kaszeta, a chemical weapons specialist, has linked hexamine detected in samples taken from and around Volcano rockets used on August 21st to hexamine declared in the Syrian government’s chemical weapon programme inventory to the OPCW. Dan Kaszeta believes hexamine would have been used as an additive, an “acid scavenger”, to the two chemicals mixed together to produce Sarin to neutralise the destructive effects of acid produced as a by-product of that reaction. Winfield – Why was hexamine on the list of chemical scheduled to be destroyed – it has many other battlefield uses as well as Sarin? Did you request to put it on the list or had the Syrian’s claimed that they were using it? Sellstrom – It is in their formula, it is their acid scavenger. The question was left out of the final published interview due to space considerations according to the editor of CBRNe World, but the interviewer, Gwyn Winfield, has confirmed the exact wording of the question and answer, and that the interview was recorded. Several times I asked the government: can you explain – if this was the opposition – how did they get hold of the chemical weapons? They have quite poor theories: they talk about smuggling through Turkey, labs in Iraq and I asked them, pointedly, what about your own stores, have your own stores being stripped of anything, have you dropped a bomb that has been claimed, bombs that can be recovered by the opposition? They denied that. 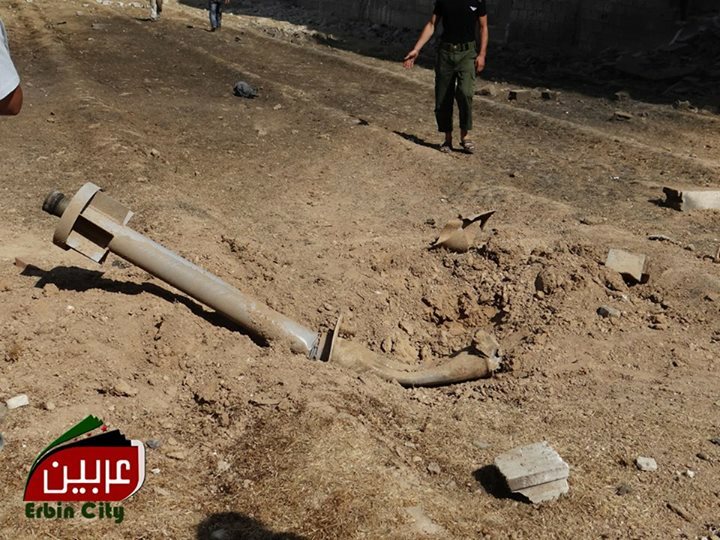 Keep in mind the Syrian government is claiming their stores were not stripped and no bomb that they used has been reclaimed by the opposition, so based on that it would seem the only way for one of their Volcano rockets to end up in Eastern Ghouta is if they fired it. The lack of a coherent theory from the Syrian government hasn’t stopped others from trying to piece together their own. The most recent and notable efforts came from Pultizer Prize winning journalist Seymour Hersh, who published a pair of articles in the London Review of Books, Whose Sarin? and The Red Line and the Rat Line. In his most recent piece he constructs a narrative where Turkey provided Jabhat al-Nusra with chemicals to make Sarin, which was then used by Jabhat al-Nusra in a false flag attack in an attempt to draw the US into the conflict. In an article by myself and Dan Kaszeta for the Guardian, It’s clear that Turkey was not involved in the chemical attack on Syria, we detailed the reasons Seymour Hersh had got it wrong, focusing on the Volcano rockets used in the attacks and the complexities of manufacturing Sarin. Seymour Hersh had previously stated “It’s not hard to make Sarin. You could mix it in the backyard. Two chemicals melded together”, which in one sense is true, Sarin is produced by mixing two precursors, except without the proper equipment you’re going to get yourself and your neighbours killed pretty quickly. When asked about the points raised by myself and Dan Kaszeta in an interview for Diken Hersh’s response was to resort to ad hominem arguments, failing to address the points we raised, or doing so in such a way that revealed his own ignorance of the facts gathered so far. Diken interviewed both myself and Dan Kaszeta asking for our response to Hersh’s reaction, and as yet Hersh has been unable to answer the points we raised in our article in the Guardian or our subsequent interviews. One point Hersh does raise is the range of the Volcano rockets, claiming that the short range would mean they couldn’t be launched from government held territory. He mentions the work of Richard Lloyd and Ted Postol, who have come up with an approximate range of 2-2.5km, but based on open source information from both sides in the conflict it’s been possible to identify government positions around August 21st, which shows 2-2.5km would still put the impact sites within range of those government held areas. Seemingly impressed by Seymour Hersh’s work, Russia Today recently stated before an interview with Ted Postol that he now believed the opposition were responsible for the Sarin attacks. More recently, Ted Postol published a document claiming to debunk claims made by Dan Kaszeta over the use of hexamine as part of the Sarin manufacturing process. As part of this document he includes private communications between himself and Dan Kaszeta (published without Dan Kaszeta’s permission), copying in “syr sis”, an email address that belongs to Maram Susli, aka Mimi al-Lamah, or more commonly known as her Twitter handle @PartisanGirl and her SyrianGirl Youtube channel. Maram is a popular figure on the conspiracy circuit, appearing on various broadcasts by individuals including the conspiracy theorist Alex Jones and the former Grand Wizard of the Knights of the Ku Klux Klan David Duke (described as “perhaps America’s most well-known racist and anti-Semite” by the ADL), among other outlets. Maram has expressed the view that the Syrian government was not responsible for the August 21st Sarin attacks, and claimed she had helped Ted Postol with his report, so it begs the question why an MIT professor had to go all the way to an Australian chemistry student known for her outspoken views on the August 21st attacks and involvement with conspiracy theorists for help with his report, rather than asking at MIT’s Department of Chemical Engineering? It has also been noted by Steve Johnson, visiting fellow at Cranfield University that in the email exchanges between Dan Kaszeta and Ted Postol published in the document “Postol’s demands of Dan encourage him to proliferate a method of chemical weapon production. Were he to do so it could technically breach US and UK law on export control”. It appears Postol is unaware of this, and takes Dan Kaszeta’s unwillingness to provide details about certain processes as evidence of some sort of purposeful deception on the part of Dan Kaszeta, rather than Dan Kaszeta staying within the boundaries of the law. She has provided us with technical information that we have needed to advance our analyses, alerted us to technical issues in chemistry that we were not aware of, and has responsibly contributed very useful information to the various technical matters we were investigating. With assistance of others, I have worked out at least one process that would produce Sarin using this method, but it would be dangerous, unethical, and possibly illegal to publish such a process. Hexamine is not previously noted in the open literature for use in Sarin production, although it should be stated that the large majority of knowledge of the manufacture of chemical warfare agents is not freely available and much of this information is classified. It is broadly agreed by anyone who has been researching the August 21st attacks, myself and Dan Kaszeta included, that the rockets used were not “mix in flight”, and that the Sarin would have been mixed before being put inside the warhead, so it’s unclear why Professor Postol spends so much time debunking a claim no-one is making. Dr Åke Sellström’s reticence to confirm Dan Kaszeta’s theories is likely due to his work with the OPCW in Syria, whose mandate prevented it from assigning responsibility for the attacks to either side, and it seems unlikely Dr Sellström would choose to do so in an unsolicited email. Gwyn Winfield, the interviewer who spoke to Dr Sellström about the hexamine claims has also confirmed Ted Postol has not contacted him about those claims. But, as with all theories, without being able to explain the use of Volcano rockets in the attacks it leaves the same hole so many other theories have failed to fill. It should also be considered that a few hours later M14 140mm artillery rockets were used to attack Western Ghouta with Sarin, and based on their impact sites it seems impossible they could have been launched from the same location as the Volcano rockets. The attack on Western Ghouta is frequently ignored by people putting together these theories, for example Seymour Hersh doesn’t mention it in any of this work, claiming the rockets used in the attacks were “homemade”, clearly not the case with the M14 rockets. It seems that the Western Ghouta attack just doesn’t fit well with any of these theories, so it’s easier just to pretend it didn’t happen. So one year on, where does that leave us? Despite the best attempts of many people, from the Russian government to a Pulitzer prize winning journalist, from conspiracy theorists to an MIT professor, it seems clear all attempts to blame the opposition for the August 21st attacks fall apart once you look at the most basic information established about the attacks. What do you think of this article that blames Turkey?